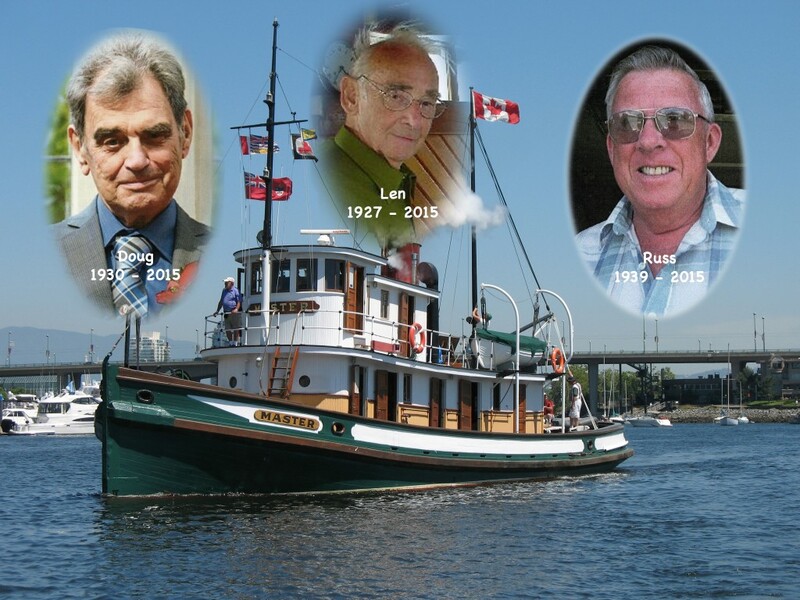 Three of the Master’s long serving and dedicated crew made their final voyage in 2015 – Chief Engineer James Douglas Shaw, Captain Russell Gordon Copeland and Leonard Guy McCann all passed away last year. Their contribution to the S.S. Master Society is immeasurable and we will forever be in their debt. They leave behind wonderful memories and are dearly missed. Born in Shanghai and educated there and in Tsingtao, he survived three years in a Japanese prisoner-of-war camp in Manila before coming to BC after the war. His reserved nature and scepticism of authority seem to have dated from this experience; he rarely sought the spotlight, but had strongly held opinions and a dry sense of humour. After work in TV production, he arrived at the Vancouver Maritime Museum in 1968 and became an expert on local ships and shipping. He was especially knowledgeable about the HBC’s Beaver, the CPR and Union Steamships’ coastal services, and the famed CPR Empresses, and for decades was a key member of the World Ship Society. Len’s great contributions were twofold: he worked tirelessly to build up the museum’s collections of artifacts, art and archives and was the first link in the chain that brought Arnold 176, the chronometer used by George Vancouver on the BC coast, to the museum. Secondly, he was generous to a fault with his time and knowledge, dedicating literally thousands of hours to help researchers with their work. He was president of the Vancouver Historical Society, 1978-1983, and a regular presence at meetings of the BC Historical Federation, but was particularly associated with the 1916 local tugboat SS Master Society. In 2014, Len received the SS Beaver Medal, given by the Lieutenant Governor through the Maritime Museum of BC to recognize outstanding contributions to the province’s maritime heritage. In a wide- ranging and witty acceptance speech, he demonstrated his great love for the Vancouver Maritime Museum (where the Archives are dedicated to his memory), its collections and the people with whom he had given the best part of his life to make it a significant institution, recognized worldwide. For those present it provided a final, happy memory of a much-loved man.